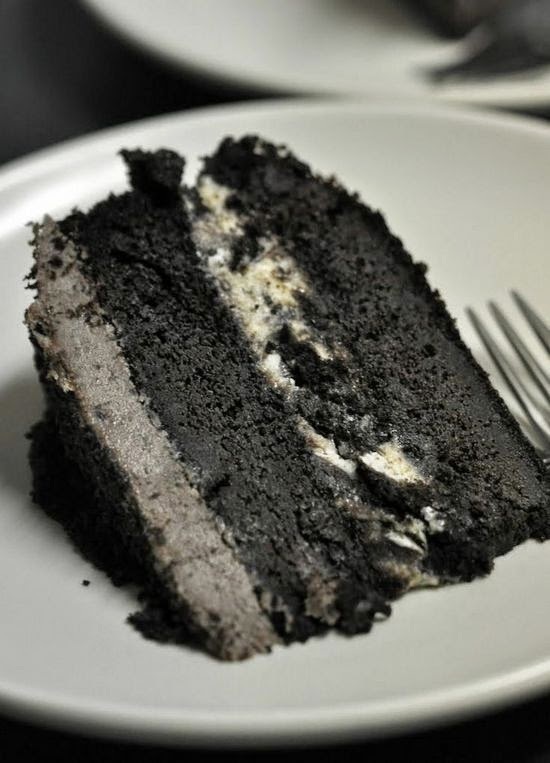 I love this recipes, very nice oreo with ice cream. Easy to make this cake, with fantastic taste. Preheat oven to 350*F. Butter the bottoms and sides of two 8- or 9-inch cake pans (layers will just be taller if you use an 8-inch pan). Line the bottoms of the pans with parchment paper, then butter the parchment. Sift the flour, sugar, cocoa powder, baking soda, and salt into a large bowl. Whisk to combine them well. Add the oil and sour cream and whisk to blend (this will be very thick). Gradually beat in the water. Blend in the vinegar and vanilla. Whisk in the eggs and beat until well blended. Scrape down the sides of the bowl and be sure the batter is well mixed. Divide among the two prepared cake pans. Bake for 25-35 minutes (less for the 9-inch pans, more for the 8-inch), or until a cake tester inserted in the center comes out almost clean. Let cool in the pans for about 20 minutes, invert onto wire racks, carefully peel off the paper liners, and let cool completely. Warm the milk, sugar, malt powder, 1 cup of heavy cream , and salt in a medium saucepan. Scrape the seeds from the vanilla bean into the warm milk and add the bean as well. Cover, remove from the heat, and let steep at room temperature for 30 minutes. Pour the remaining 1 cup cream into a large bowl. In a separate medium bowl, whisk together the egg yolks. Slowly pour the warm mixture into the egg yolks, whisking constantly, then scrape the warmed egg yolks back into the saucepan. Pour the custard into the large bowl of heavy cream. Add the vanilla extract and mix well. Chill the mixture thoroughly in the refrigerator. When ready to churn, remove the vanilla bean, rinsing and reserving it for another use. Add the vodka then freeze the mixture in your ice cream maker according to the manufacturer’s instructions. Once the ice cream is done churning, mix in the crushed Oreos with a spatula before transferring to a container. Chill in the freezer for at least 3 hours before using. Using a hand mixer, beat the cream cheese with the salt until smooth. Alternately add powdered sugar and milk until you reach your desired consistency. Mix in the Oreo crumbs. Use immediately, or refrigerate and let come to room temperature before using. Make sure that your cake is cooled completely, your ice cream is solid, and you have a level place in the freezer to stash the cake as you assemble. Place one cake layer on a nice plate (you can chill the cake layers in the freezer as well, for extra insurance). Use a large cookie scoop to scoop 1-2 cups of ice cream on top of the cake layer. Quickly spread the ice cream evenly around the cake. Freeze for at least one hour, preferably two. Once the ice cream has hardened back up again, take the cake out of the freezer and place the second cake layer on top. Frost with cream cheese frosting. Freeze again, but now for at least 2-3 hours. If you want to cover the cake with foil or plastic wrap, do so at this point. It’s sliceable and not too hard to eat directly out of the freezer given the vodka in the ice cream and that the cake is oil-based rather than butter-based. That will also keep the cake from drying out too quickly, even in the freezer.